Organized as three sections on Discipline and Desire, Whats Wrong with Literature? and Romanticism Lost, this book is concerned with the state of the profession of Shakespeare studies. 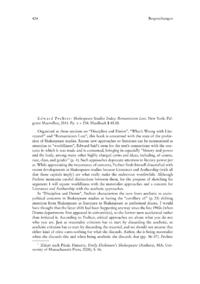 Recent new approaches to literature can be summarized as attention to worldliness, Edward Saids term for the texts connections with the contexts in which it was made and is consumed, bringing in especially history and power and the body, among many other highly charged terms and ideas, including, of course, race, class, and gender (p. 4). Such approaches deprecate attention to literary power per se. While appreciating the importance of contexts, Pechter finds himself dissatisfied with recent developments in Shakespeare studies because Literature and Authorship (with all that those capitals imply) are what really make the endeavour worthwhile. Although Pechter maintains careful distinctions between them, for the purpose of sketching his argument I will equate worldliness with the materialist approaches and a concern for Literature and Authorship with the aesthetic approaches.